They were mortal men, though made of metal not of this earth. 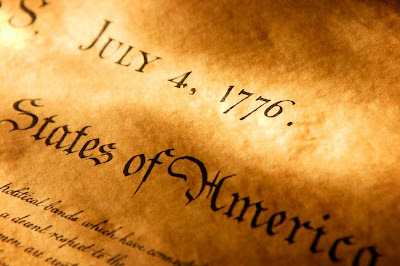 The 56 signers of the Declaration of Independence were nothing more sensational or remarkable than anyone of us. Except one thing. They believed. This wasn't about expressing a political view and being disliked, joked about on Jay Leno, gossiped about on the McLaughlin group, or broadcast on YouTube. Their act wasn't a media stunt, a sound bite, or a stumping speech. Their motivation wasn't from a Gallup poll or a Hollywood blockbuster. They signed with their life. This wasn't even a final act of redemption for a group of old men. Most were young, well-accomplished, highly educated, and seriously successful. All were men with wealth and families, except two. They were men with their lives ahead of them and everything to lose. Yet, they signed. They committed treason, an act punished by hanging, an act performed though a British fleet anchored in New York Harbor. This wasn't a boy's club, a place to sit and jaw and fan themselves while debating philosophy and economics. They would have no bodyguards to surround them, no armored car to whisk them away. They would sign. And their lives would cease to remain the same, if they lived at all. As Stephen Hopkins signed, his pen shaking, he said, "My hand trembles, but my heart does not." This is what they gave up. - Francis Lewis, New York delegate saw his home plundered -- and his estates in what is now Harlem -- completely destroyed by British Soldiers. Mrs. Lewis was captured and treated with great brutality. Though she was later exchanged for two British prisoners through the efforts of Congress, she died from the effects of her abuse. - John Hart of Trenton, New Jersey, risked his life to return home to see his dying wife. Hessian soldiers rode after him, and he escaped in the woods. While his wife lay on her deathbed, the soldiers ruined his farm and wrecked his homestead. Hart, 65, slept in caves and woods as he was hunted across the countryside. When at long last, emaciated by hardship, he was able to sneak home, he found his wife had already been buried, and his 13 children taken away. He never saw them again. He died a broken man in 1779, without ever finding his family. - Judge Richard Stockton, another New Jersey delegate signer, had rushed back to his estate in an effort to evacuate his wife and children. The family found refuge with friends, but a Tory sympathizer betrayed them. Judge Stockton was pulled from bed in the night and brutally beaten by the arresting soldiers. Thrown into a common jail, he was deliberately starved. Congress finally arranged for Stockton's parole, but his health was ruined. The judge was released as an invalid, when he could no longer harm the British cause. He returned home to find his estate looted and did not live to see the triumph of the Revolution. His family was forced to live off charity. - George Clymer, Pennsylvania signer, escaped with his family from their home, but their property was completely destroyed by the British in the Germantown and Brandywine campaigns. - John Martin, a Tory in his views previous to the debate, lived in a strongly loyalist area of Pennsylvania. When he came out for independence, most of his neighbors and even some of his relatives ostracized him. He was a sensitive and troubled man, and many believed this action killed him. When he died in 1777, his last words to his tormentors were: "Tell them that they will live to see the hour when they shall acknowledge it [the signing] to have been the most glorious service that I have ever rendered to my country." - William Ellery, Rhode Island delegate, saw his property and home burned to the ground. - Thomas Nelson, signer of Virginia, was at the front in command of the Virginia military forces. With British General Charles Cornwallis in Yorktown, fire from 70 heavy American guns began to destroy Yorktown piece by piece. Lord Cornwallis and his staff moved their headquarters into Nelson's palatial home. While American cannonballs were making a shambles of the town, the house of Governor Nelson remained untouched. Nelson turned in rage to the American gunners and asked, "Why do you spare my home?" They replied, "Sir, out of respect to you." Nelson cried, "Give me the cannon!" and fired on his magnificent home himself, smashing it to bits. But Nelson's sacrifice was not quite over. He had raised $2 million for the Revolutionary cause by pledging his own estates. When the loans came due, a newer peacetime Congress refused to honor them, and Nelson's property was forfeited. He was never reimbursed. He died, impoverished, a few years later at the age of 50. Special thanks to Rush H. Limbaugh, Jr who wrote such an inspiring speech about the men who gave away their freedom for our future. Thanks for offering more than just a history lesson. It's a glimpse into unabashed patriotism. And why we should expect no less from ourselves. Read Mr. Limbaugh's speech here. Seriously. I'm not kidding. Read it.